Where Will Larry “Spiderman” McBride Race This April, SGMP or The Cup? Top Fuel legend Larry “Spiderman” McBride would rather suffer a first-round red light than have to make the difficult decision he is faced with. The Spiderman cringed upon hearing South Georgia Motorsports Park and The Manufacturers Cup group will hold competing events on the same weekend this coming April. Having to choose between the two events and his friends on each side makes McBride uncomfortable. So where will the 11-time champion race on the weekend of April 5-7, Valdosta, Ga. or Bradenton, Fla.? “They forced my hand. I am going to put a paddle tire on the back of my bike and start sand dragging,” joked McBride. McBride supports South Georgia Motorsports Park because he appreciates all of the hospitality the venue has shown drag bike racers over the past five years under three different sanctions; Prostar, Dragbike and The Manufacturers Cup. McBride admires the passionate group of fans in Valdosta and loves the ultra-smooth racetrack. McBride supports the Manufacturers Cup because he has several sponsors and friends among them. McBride wants to see the group succeed and grow The Cup events into a thriving national series. So what is the Spiderman to do? McBride says he is going to wait to make his decision. The Spiderman did however express some concern about racing on an unfamiliar Bradenton track. McBride’s phone has been ringing constantly. Both groups are eager to get a commitment from the record-holder and fans and racers want to know where, arguably, the sport’s greatest attraction, will be. Having the nation’s quickest motorcycle as part of the show will say a lot as to who has the more prominent event. SGMP track manager Tim Fleming is known as a big fan of McBride’s operation. Fleming has already reached out to Team Spiderman. As for now, we will all wait for an answer. The Top Fuel record-holder is conflicted. McBride thanked sponsors; Pingel Enterprise, Trim-Tex Drywall Products, Drag Specialties-Parts Unlimited, Red Line Synthetic Oil Corporation, K&N Air Filters and Web-Cam as well as his other sponsors. Vance & Hines Motorsports, PR Factory Store, Muzzys Performance, Ferrea Valves, Kibblewhite, Precision Machine, World Wide Bearings, Vanson Leathers, Performance Machine, Belt Drives Ltd, Street & Competition, Simpson Race Products, Nitrous Express, APE, EK Chain, Arias Pistons, R/D Spring Corp, Autolite, MSD, Protect ALL, Whipple Industries, Cometic Gaskets, B&J Transmission, Carolina Cycle, L.A. Sleeve, PJ1, Mickey Thompson Tires, Valco, Goodridge, Carlisle Belts and Gates Belts. BMP doesn’t have steel guardrails .. Just a short time ago the track was gound and is super smooth .. 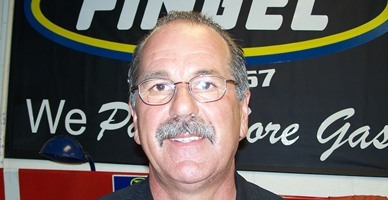 The Staff is A+ and likes bikes ..Wade worked there for many years and was great at track prep .. The staff at BMP knows what they are going .. Some of the fastest 10 1/2 tire cars run BMP .. Thanks for the info Lee. Are there still steel guardrails in the shutdown area? I believe that was what Larry was concerned about. Also, do you think the track woud be able to handle an event of this magnitude? shut down area , geography of track surface . I,d rather watch top fuel drag bikes run 1,000 ft.
or 660 ft. where safety is a question. in plain english 1/4 mile or less when riders specify .